The AAA’s annual travel forecast projects that 34.4 million Americans will drive more than 50 miles from home during the July 4th holiday, a tiny dip from 34.7 million last year. The chief reason, according to AAA, is that the five-day holiday period is a day shorter than it was in 2012, when July 4 fell on a Wednesday. But other vehicle-related measures point to longer-term substantive declines in Americans’ attachment to their cars, trucks, vans and SUVs, according to a new paper by University of Michigan researcher Michael Sivak. He reports that the number of U.S. registered cars, trucks, vans and SUVs has gone down since the onset of the Great Recession. So have the rates of registered vehicles per person, per licensed driver and per household. For example, the number of registered vehicles in the U.S. peaked at 236.4 million in 2008, and stood at 233.8 million in 2011. That number is likely to rise again, and exceed the 2008 record, Sivak concludes. However, Sivak points out that the three declines in rates were underway before the recession began. He links those decreases not just to the economic downturn, but also to broader social trends such as increases in telecommuting and use of public transportation. The number of registered vehicles per person peaked in 2006, according to the analysis. 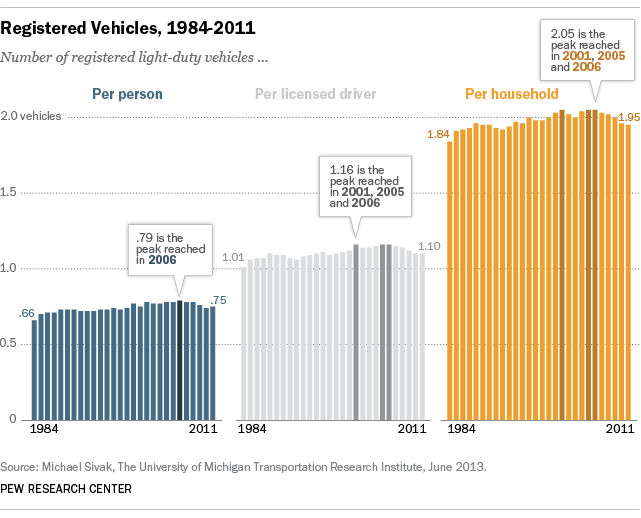 The number of vehicles per licensed driver peaked in 2001, 2005 and 2006. See fewer cars parked in driveways these days? Vehicles per household peaked in 2001, 2005 and 2006. As has been documented, the most likely age group to shun vehicles is young adults. An analysis by the Pew Research Center found that turning 16 does not necessarily require the traditional teen rite of passage to getting one’s driver’s license the same day, or year for that matter. The share of adults ages 18 to 34 with a driver’s license declined to 83% in 2011 from 86% in 2001, whereas the share for adults ages 35 and older was 90% in 2011, compared with 89% in 2001. Also, households headed by adults younger than 25 were the only household age group to show a decline in vehicle ownership from 2001 (72% of households) to 2011 (66% of households). Similarly, among households headed by someone younger than 35, the share with vehicle loan debt fell sharply from 2001 (45%) to 2010 (32%). But among households headed by someone age 35 or older, vehicle loan debt declined only slightly from 2001 (32%) to 2010 (30%). Sivak’s research did not explore the emotional aspects of vehicle ownership, but a 2006 Pew Research Center survey found a waning affection for cars among adult Americans who drive. In 2006, only 23% said they think of their car as “something special—more than just a way to get around,” compared with 43% who said so in 1991.